I've never had an easy time crafting a coherent, ideologically consistent set of foreign policy positions. As a mostly small-l libertarian, or "classic liberal" (something like that), I'm supposed to be inherently suspicious of the State in all its forms and therefore devoted to small government in all its forms - including that devourer of enormous portions of our GNP, the military. My liberal tendencies have me sometimes making common cause on matters of war & peace with those on the Left whom I otherwise disdain for their utter cluelessness on economic matters, where my own ideology is what I'd like to call "rigidly informed", and in which my mind was made up a long, long time ago. Yet my devotion to the American ideal and for Western Civilization's values in general have led me to realize, on occasion, that war truly is the answer sometimes. I remember reading Brian Doherty's excellent history of libertarianism "RADICALS FOR CAPITALISM" a few years ago and coming across a strong and very vocal subsection of American libertarians during World War II who were fully and totally against it. Our war was one of imperialism, in their eyes. I tried to come to grips with this view on many levels, rather than look at Hitler's rampage through Europe and Japan's through Asia with the benefit of hindsight. Couldn't do it. Try as I might, I kept coming back to the question, "If that war wasn't worth fighting to the bloody end, then what was?". Hence my suspicion at the reflexively anti-war position. Not because a few ideological Puritans were against fighting Hitler seventy years ago, but because the anti-war left has always had that naive view of humanity, and believes in imagined utopias that will never exist - the ones in which we don't fight, don't compete for resources nor have base, all-too-human instincts for power and dominion. I'm also the confused and sometimes weak-kneed guy who was gung-ho for the US wars in Afghanistan and Iraq upon their commencement, and who, when the going got tough in both, argued for them to be wound down. 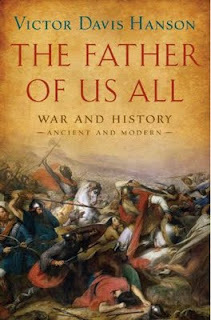 I still want them wound down - though I'll admit, after reading "THE FATHER OF US ALL: WAR AND HISTORY, ANCIENT AND MODERN" by Victor Davis Hanson, I haven't had my thinking cap turned so backwards by a book in a great while. I can't recommend it highly enough. I came into it with an idea that I might need a stiffening of my ideological spine, because even I was confused by my schizophrenic positions on how to confront "terror" and what particular battles might be worth investing American blood & treasure in to win. I came away from this fairly determined to look at war differently than I had before. Please allow me to explain. Pure conservatives, like pure liberals, have the luxury of looking at these matters through an all-or-nothing lens. "Might makes right" - "Peace through strength" - "Project power across the globe" etc. It's easy to caricature, isn't it? Particularly when us "elites" see these words mouthed by toxic Republican politicians with Christianity in their foregrounds. Step away from that for a second. If anything, Hanson's book lays out for me, in a series of essays on man's inherently warlike nature and the importance of taking the "long view" in matters of war & security, why it's important to listen to the simplistic conservative approach to military matters. There's a reason why every liberal Democrat president we've elected, even successful or would-be economic radicals like Roosevelt and Obama, ends up taking the same philosophically consistent approach as Republican presidents do on matters of security. These men are truly defending Western Civilization, and the values we hold dear. This becomes crystal clear once in office and off the campaign trail. They recognize that war is rarely the first option, and is often simply the least-worst of many bad options. This last point is hammered home repeatedly throughout this book. Hanson argues with much success that the best war, with the best long-term outcome, is the one that is waged decisively and ends with the enemy's humiliation. This is not to say that he is not and cannot be critical of American military and political blunders - he takes the Bush administration to task for many costly errors in the war in Iraq, all the while arguing that comfortable Americans (like me) are so squeamish and short-sighted that they lose their stomachs at setbacks that previous generations would have taken as a reason to redouble efforts. This book is not about the 20th and 21st century - Hanson reaches well back to Athens vs. Sparta, Rome vs. Carthage and to Crusaders and Ottomans to underscore his points. He's a university professor of history, and his opening essay in this book, "Why Study War?" is one of the best. It makes me think that instead of taking multiple sociology courses from avowed Marxists at my school in the 80s, I'd have done well to add to true open-minded learning and take in a perspective that intelligently looked at war over the continuum of history and as part of our collective DNA, not as simple-minded excuses for "resistance" by pampered American college kids. I think every war needs to be picked apart and argued before it begins. I am still quite sympathetic to reasonable views about a more "isolationist" America. I'd rather we hadn't started our wars in Iraq and Libya - though I'm open to taking in a longer view on their success or failure once we see what it does to the Arab world and to the longer-term defense of the West, which I support (there are values very much worth fighting for, I'm sure you'd agree). Yet this excellent book is the most intelligent and convincing voice I've ever heard for what we'd probably call the "conservative" approach to foreign policy. My personal politics just became that much muddier, and I have to admit that it might have to be a lifelong project to figure it all out.